Back in July of 2005 we blogged about our "view of the world". 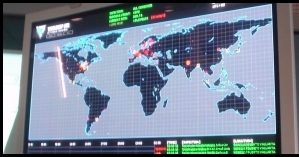 Here at our labs we have a system that allows us to view a visual representation of virus infections worldwide. We can plot viruses in real-time or see an elapsed history. After blogging about this system, we got requests from our users to make a version that would be available for everyone online. Well, that's just what we've done with F-Secure World Map. Visitors can easily see the virus situation at any given time and also in a particular location.